We're inviting you to play and stay in our "Outdoor Paradise". Take in our great food and lodging to round our your whole experince. 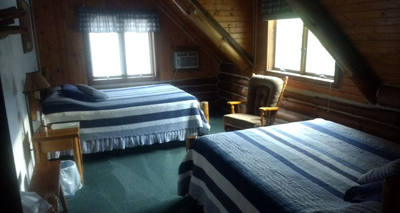 The lodge, uniquely decorated, gives you that north woods feeling. You can relax with friends in the great room in front of a crackling fireplace, enjoying the conversation, or curl up with a good book. The Mecan River Lodge experience is one you will not soon forget. 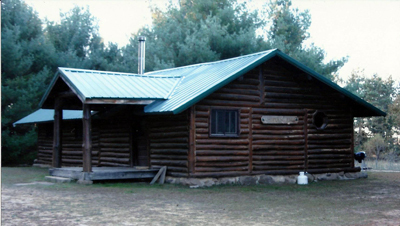 The Mecan River Lodge was completed in October of 1994. 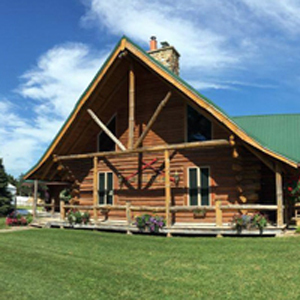 Because it was built by our own family, we take pride in this spectacular log building. Built of red and white pine that we cut and hand peeled ourselves, this 6000+ square foot building is a beautiful addition to the outfitting, allowing us to be a full-service facility. There are five bedrooms. Four have two queen-size beds in each, one room being smaller. Each room is decorated with it's own unique style. Common bathrooms, towels, and linens provided. Breakfast is also included with your stay. Dining and bar are open to the public. The Mecan River Lodge is a non-smoking facility. Construction took 18 months. 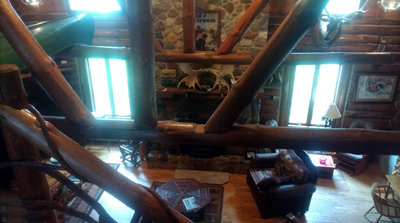 The lodge boasts a 35-foot fieldstone fireplace, and five rooms for lodging fill the upstairs. 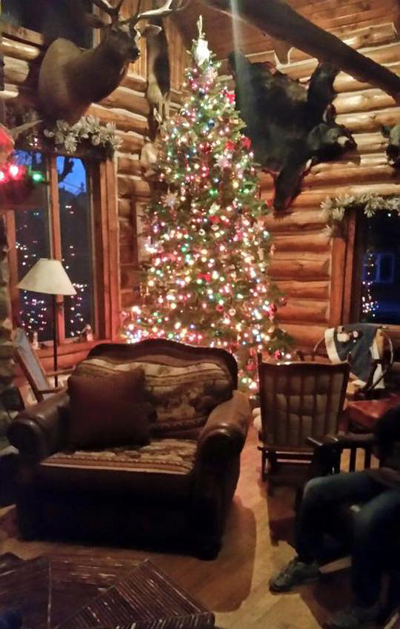 The rooms, each decorated a little differently than the others, expresses our love for the outdoors. There are shared baths...towels and linens supplied. The absence of phones and televisions in the rooms gives you a greater sense of “being away from it all.” We have a full-service bar. Visit our rental shop located next to the lodge. The Mecan River Lodge is a non-smoking facility. Rates are based on a double occupancy. Two night minimum Memorial Day through Labor Day weekend (weekends only). Reservation deposits are required for all reservations. The lodging is the most important one to reserve. One night’s deposit is required for short stays, and a deposit of 50 percent is required for week-long stays. The deposit is applied to the last days of your reservation. To avoid misunderstandings, you will be charged for the number of days reserved. If cancellations are received 21 days prior to your arrival date, or if another reservation is taken to replace your cancellation, a full refund minus a $30 service charge will be given. No other refunds apply. All prices are subject to a 5.5 % state and county tax combined. Prices are subject to change without notice. Pets are allowed in the cabins, but not in the lodge. Check in is after 2 p.m. 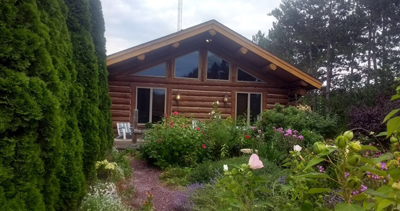 Check out at the lodge is 11 a.m., and noon at the cabins. Enjoy the perfect getaway. 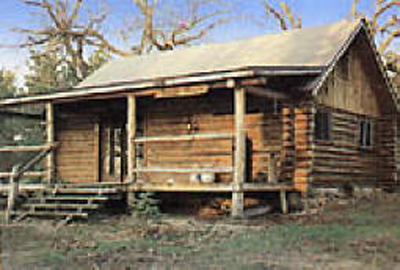 Stay at our rustic, secluded log cabins hidden amongst the pinesThese unique, one-of-a-kind cabins are equipped with just enough to make your stay a most comfortable one. For the canoeist who would like to return to our base for the evening, they are the perfect way to end your day. 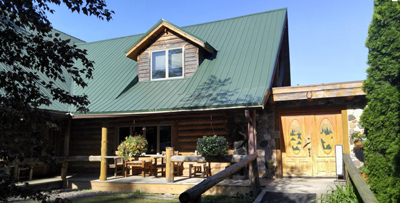 For the skier, the cabins are located on the ski trails. Ski at your leisure, with no worries of returning home at the end of the day. Or, if you have had enough of the fast-paced world, slow down with us. These cabins are all located in a woodland setting. No phones. No electricity. There are his and hers outdoor privies. You provide your own sleeping bags, towels, and food. We furnish cooking and eating equipment along with firewood and gas lights. 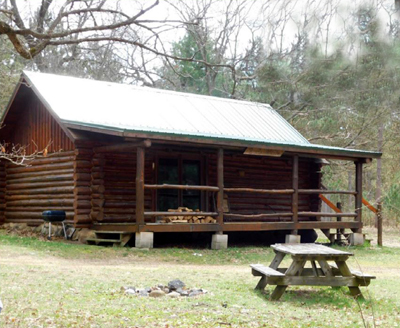 The cabins also have picnic tables and outdoor firepit. Showers are available at the lodge along with food and drink. Prices based on double occupancy and a two night minimum. 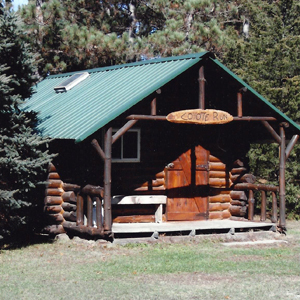 Coyote Run is a cute one-room log cabin that sleeps two to four people. $85 per night, $10 per additional adult per night. Birch Hollow is big enough to handle up to ten people. Whispering Pines will house eight people comfortably. All prices subject to 5.5 % state and county sales tax combined. Prices subject to change without notice. Visa and MasterCard accepted. Pets allowed in the cabins but not in the lodge. Pet charge of $10/pet. 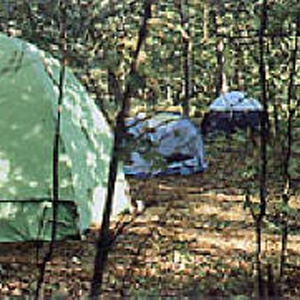 If camping is your style, we have primitive camping sites at our base, or on the river. Camping sites based on 4 campers. Showers are not available for primitive campers. On Our Farm, $25.00 per night; $4/additional person. All prices subject to 5.5 percent state and county sales tax combined. Prices subject to change without notice. Visa and MasterCard accepted. 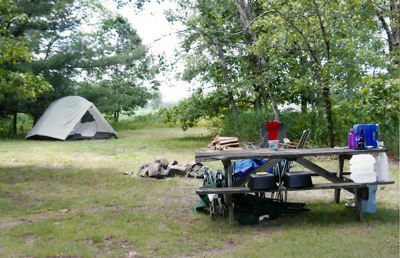 Overnight Camping on the river would be at Oak Grove Campground. Call ahead for details. Over the years we have handled many organizations, from Boy Scout camping outings to many other adult groups. We take the hassle out of your trip planning.